On September 26, Ambassador Liu Xiaoming met at the Chinese Embassy with Cheung Kin-chung, Chief Secretary for Administration of Hong Kong SAR Government and his delegation that is visiting the UK. Ambassador Liu noted that since its return to China, Hong Kong has made remarkable achievements, including the newly-opened Guangzhou–Shenzhen–Hong Kong Express Rail Link, the successful completion of Hong Kong-Zhuhai-Macau Bridge, and the full-scale construction of Guangdong-Hong Kong-Macau Big Bay Area. This year marks the 40th anniversary of China’s reform and opening up, in the process of which, Hong Kong has been playing its special role. He hoped that Secretary Cheung could share the success stories of “One Country, Two Systems” and Hong Kong’s prosperity in various fields to the British society. The Ambassador pointed out that at present, China-UK relations on the whole are developing well, and Hong Kong has increasingly become a bridge between China and Britain. 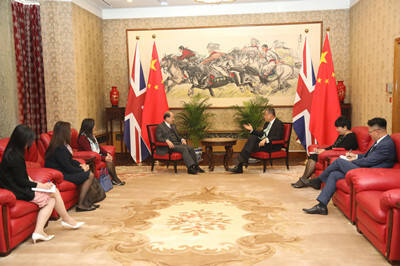 He hoped that Hong Kong would give full play to its own strengths in financial and legal services and seize the historical opportunities of Belt and Road Initiative and the construction of Guangdong-Hong Kong-Macau Big Bay Area to accelerate its development and help China-UK relations to bear more “Golden Fruits” in the “Golden Era”. Ambassador Liu stressed that the recent decision of the Hong Kong SAR government to ban the Hong Kong National Party in accordance with relevant laws and legal procedures is a necessary move to safeguard national security and Hong Kong’s rule of law, and we strongly support it. We firmly oppose the irresponsible remarks of some foreign governments and call on them to respect the Hong Kong SAR government's decision to outlaw the “Hong Kong independence” group, stop interfering in Hong Kong’s affairs and China's internal affairs, and fulfill their commitments of not supporting "Hong Kong independence" through concrete actions. Secretary Cheung said that he was born in Hong Kong and has been working there for nearly 50 years. He has witnessed the progress in Hong Kong. With the full support of the Central Government, the various undertakings in Hong Kong have been advanced steadily, and the development of innovation and technology is particularly rapid. Being a fervent participant and a beneficiary of China’ reform and opening up, Hong Kong will make the most of the close links with the Mainland to carry out closer cooperation. 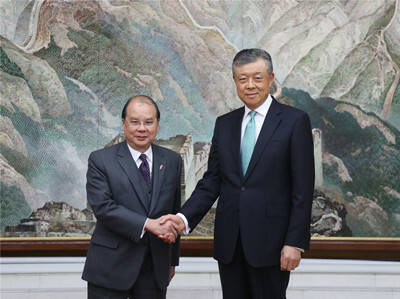 He expressed his thanks to the Central Government for its effective measures to oppose and stop the foreign intervention in Hong Kong’s affairs to guarantee Hong Kong’s long-term prosperity and stability. Secretary Cheung said that during his visit in the UK, he would show Hong Kong’s achievements comprehensively to people from all walks of life in the UK in order to enhance understanding and reduce misunderstandings. Looking ahead, Hong Kong stands ready to participate in the Belt and Road Initiative and the construction of Guangdong-Hong Kong-Macao Big Bay Area to contribute to the development of the country and China-UK “Golden Era”.